Atlanta Real Food: Smile and say "lychee!" Just saying "lychee" will bring a smile to your face. No, really! Try it. In addition to smiles and speaking the fruit's name, we now have fresh lychees available from Florida tropical fruit grower Fresh Gardens. Lychees are in season in southern Florida beginning May through July, so get them while the getting is good! Now through May 31st, Fresh Gardens is offering a special on their Lychees. When you buy one box, get a second box at half-price. 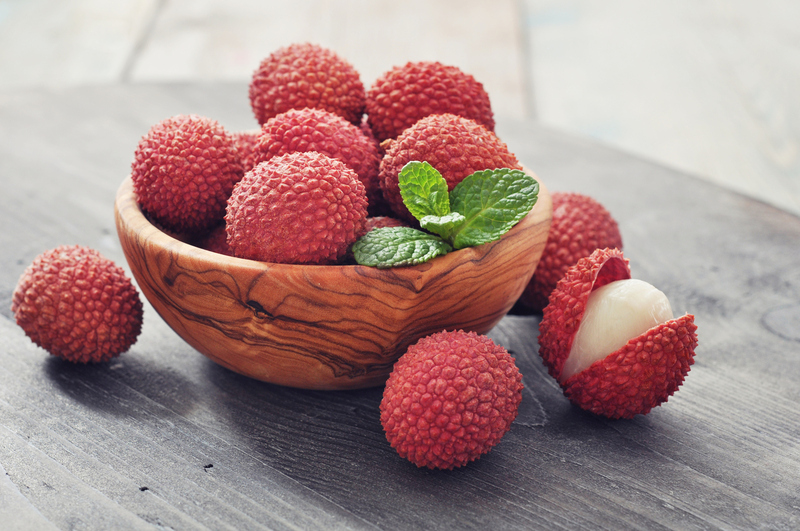 What are lychees? Lychees are golf-ball sized sweet, smooth, juicy fruits with a red bumpy peel. Eating them is part of the fun. Once you peel the outer shell, you'll reveal the soft shiny-white flesh inside, which is popped into your mouth and savored. There's a smooth brown pit in the middle, so once you're done, spit out the pit and marvel at the experience. Lychees are delicious cooling snacks on a warm day, and excellent in cocktails and desserts.